We trust that the medications and medical devices that are recommended to us by doctors will heal us. We have a right, at the very least, to expect that these products will not hurt us. However, our Atlanta defective drug attorneys have decades of experience helping innocent people hurt by medications and medical devices. This very fact demonstrates that too many large pharmaceutical companies and device makers cut corners with their products. Defective products are always dangerous. But injuries caused by defective medical devices and drugs are particularly tragic. 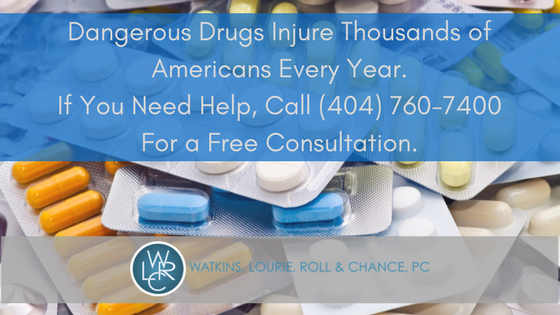 If you're an Atlanta, Georgia resident and you need an experienced defective drug attorneys, please call Watkins, Lourie, Roll & Chance, PC today at 404-760-7400 for a free consultation. Modern prescription drugs and medical devices are exceptionally powerful. They act in complicated ways and stimulate your body to produce hormones and chemicals. As such, they must be carefully designed, calibrated and manufactured. However, the profit motive often induces pharmaceutical companies into cutting corners with design and manufacture. These companies can also use unethical tactics to receive approval from overwhelmed and under-funded federal regulators. It's important to remember that all sorts of medications and devices can prove defective and hurt those they were intended to help. You should contact our defective drug attorneys if you've suffered an injury related to your use of a device or drug (prescription or over-the-counter). Defective drug litigation is exceptionally complicated and technical. It requires a keen understanding of difficult legal concepts, medicine and issues related to engineering and manufacturing. It's important you find the right attorney to pursue your case. At Watkins, Lourie, Roll & Chance, PC, our defective drug attorneys understand all of the issues involved in this type of litigation. We understand the severity of the injuries you've suffered. And we know how to hold pharmaceutical companies accountable for their mistakes. We'll be happy to discuss your injuries at a free consultation. We'll listen to your story and help you decide if legal action is appropriate for you. If you live anywhere in the Atlanta, Georgia area and you've suffered an injury from a defective drug or medical device, you should speak to our defective product attorneys as soon as possible. Please contact Watkins, Lourie, Roll & Chance, PC today for a free consultation.